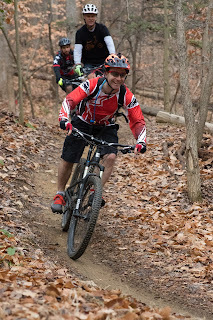 One of the best things about mountain biking is the group camaraderie we experience riding together. Mountain bike festivals and meetup group rides are common ways we gather and meet new riding partners. If you find yourself in a position to lead one of these semi-formal group rides, here are good general rules that you can adapt to your group and style. Know the group: Get a headcount and remember it! Then judge the group's ability. If you are riding with complete strangers this can be hard, but a quick introduction at the start, for example, asking who everyone is and what their favorite area is, can help judge rider level without being too obvious. Watching riders in the first few miles is a better indicator--riders may overestimate (or underestimate) their ability, so be ready to make adjustments if necessary. Later in the ride, they may not speak up, it may be up to you to gracefully make the adjustment without calling them out. Communicate all directions: Slow when approaching trail junctions and make sure everyone is aware of the way. Often the leader can send the fast riders on to the next junction and make sure all the rest of the riders make the turn before continuing. Asking riders to be responsible to inform the rider behind them is a good idea, but don't depend on this as the leader. It is your responsibility to make sure everyone is on route! One customary instruction is "Nothing said, straight ahead". If no turn is going to be made at a junction with an obvious straight direction, this helps keep the group moving. But be sure you tell the group this instruction in the beginning of the ride, and reinforcing it at the first junction is helpful. And have a plan if someone gets left--for example, have them wait at the last intersection, and use your headcount often to make sure no one is left behind. If possible, have another rider familiar with the route act as "sweep", riding last to make sure everyone stays on route. Trail etiquette: Yield the trail to all other users, even when typically etiquette indicates otherwise. Groups can annoy other users, especially in rough conditions (mud, dust, hills) so this helps maintain civil relationships. Greet other trail users every time, and its a good practice to let them know how many are coming behind you. And when you stop for rest or to gather the group, stop beyond the crest of the hill--there is nothing worse than being a following rider and the leader is perched just at the crest of the hill, forcing everyone else to start going uphill! 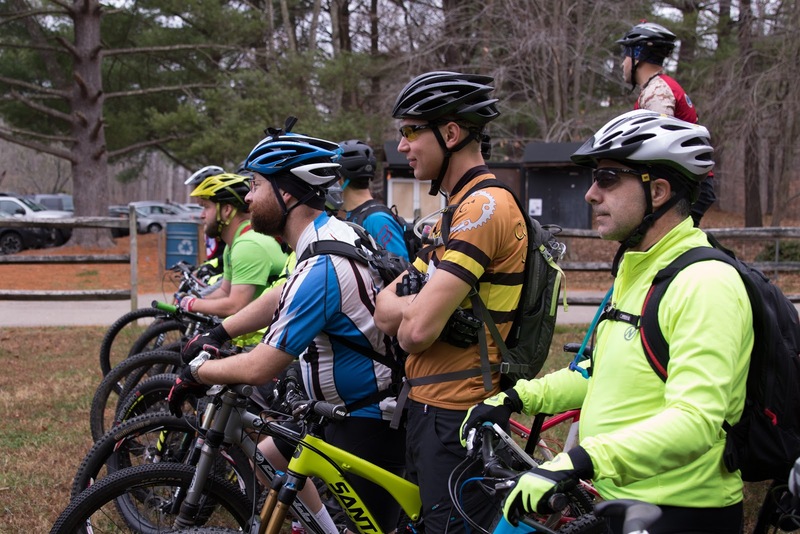 Be sure everyone is ready to move after the group gathers for a stop or rest--don't leave as soon as the last rider arrives, give them a chance to rest some too! Be inclusive. Be a Leader! Here are some ways: During a big climb, slow down as you approach the top, this gathers the group so that everyone reaches the top at a similar time. Alternatively, if you have speedy climbers that want to blast off, no problem, let them go, then you, as leader, finish the climb riding with the slower riders. There's nothing more humiliating for new or slower riders to have the group watch them struggling up the final push while everyone is waiting and staring. If you ride in with them, the entire dynamic changes and everyone is a team. Be prepared to help repair minor mechanical issues and minor first aid issues. It's a good idea to carry: a first aid kit, a spare derailleur cable, a couple of innertubes (a 26 and 27.5 is a good idea--smaller tubes can go on larger wheels if needed, tougher to put larger tubes on smaller wheels), some chain quick links, a tube patch kit.